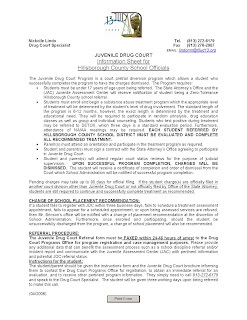 The Juvenile Drug Court Program is a court pretrial diversion program which allows a student who successfully completes the program to have the charges dismissed. • Students must be under 17 years of age upon being referred. The State Attorney’s Office and the (JAC) Juvenile Assessment Center will receive notification of student being a Zero-Tolerance Hillsborough County school referral. • Students must enroll and begin a substance abuse treatment program which the appropriate level of treatment will be determined by the student’s level of drug involvement. The standard length of the program is 6-12 months, however, the exact length is determined by the treatment and educational need. They will be required to participate in random urinalysis, drug education classes as well as group and individual counseling. Students who test positive during treatment may be referred to DETOX, which three days is a standard evaluation period. Furthermore, attendance of NA/AA meetings may be required. EACH STUDENT REFERRED BY HILLSBOROUGH COUNTY SCHOOL DISTRICT MUST BE EVALUATED AND COMPLETE ALL RECOMMENDED TREATMENT. • Parent(s) must attend an orientation and participate in the treatment program as required. • Student and parent(s) must sign a contract with the State Attorney’s Office agreeing to participate in Juvenile Drug Court. • Student and parent(s) will attend regular court status reviews for the purpose of judicial supervision. UPON SUCCESSFUL PROGRAM COMPLETION, CHARGES WILL BE DISMISSED. The student will receive a certificate of completion and order of dismissal from the Court which School Administration will be notified of successful program completion. Pending charges may take up to 90 days for official filing. If the student charge(s) are officially filed in another court division other than Juvenile Drug Court or not officially filed by Office of the State Attorney, students are still required to continue and successfully complete treatment as recommended.